First, just a picture of us before we left Green Lake. 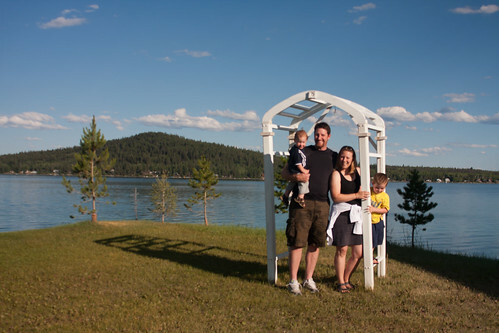 Gary and I were married under this arbour 5 years ago so we try to get a picture there every year. We left Green Lake and drove about 8 hours to Kananskis. 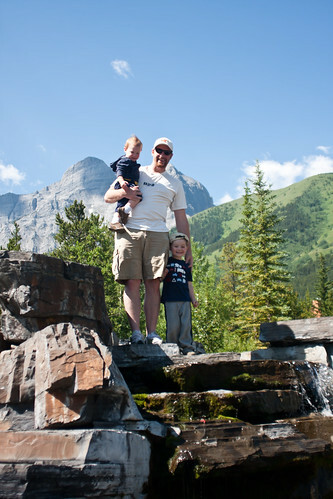 We stopped in at Lake Louise at dinner time. 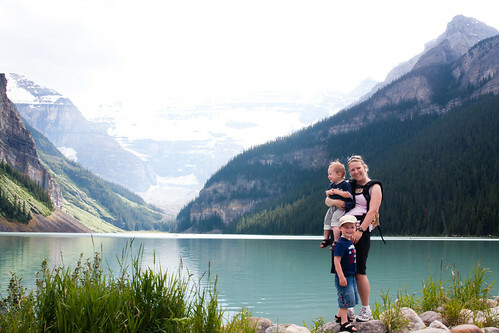 I love Lake Louise!! Koen is such a monkey and was basically running into the water and climbing on every possible structure. 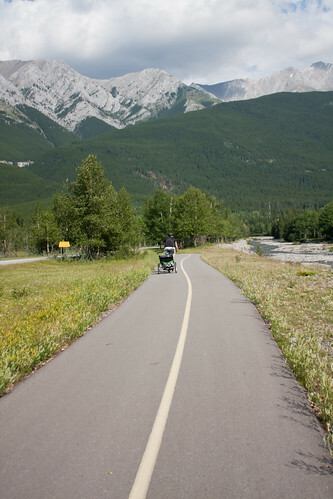 I wanted him to be able to run around to stretch his legs but ended up putting him in the Ergo for a bit (and a LOT on the trip) so that I didn't have to run after him. He has so many injuries, at least one bad one to his face each day. 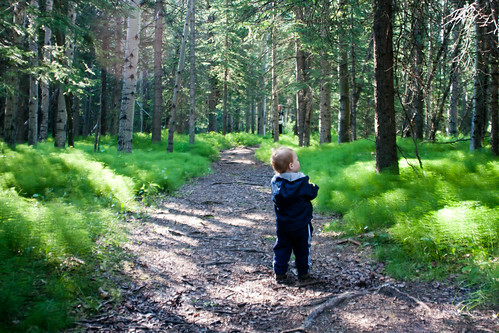 His age, 18 months, is a tough one in regards to camping. The boys travelled quite well, I must say. 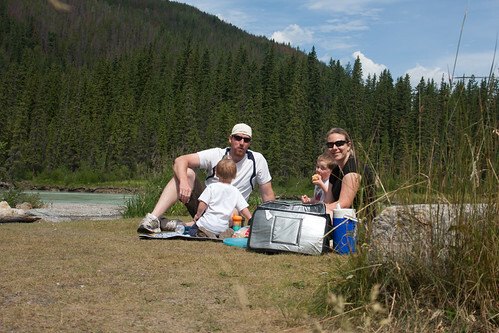 We did a similar trip to Alberta last year and it was so hard to do that with Koen (at about 6 months). Last year he screamed and had reflux and I was breastfeeding etc. This time he could entertain himself with food, milk, and his toes. He also loved having dance parties and singing. Kai is an amazing traveller. He probably only watched his DVD player for 1/2 hour the whole time. He just looked around and chatted and sang. Four is a wonderful age for travelling! 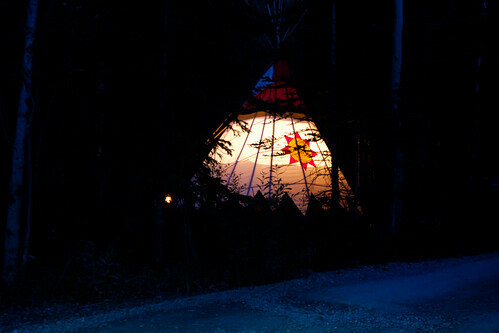 The first night we stayed in a teepee at Sundance Lodges. It was a beautiful location. Inside the teepee was a heater and 4 beds. Koen slept in his playpen. The boys chatted until about 10pm and then fell asleep. It was insanely cute listening to them chat. 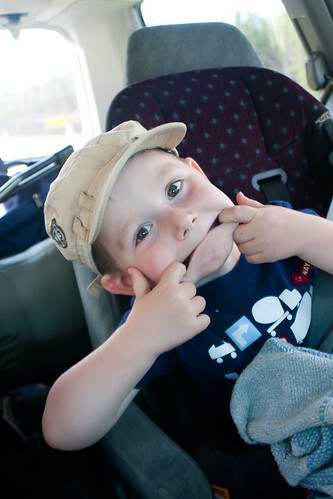 Koen would say, `Tai! Tai!' (his way to say Kai) over and over. 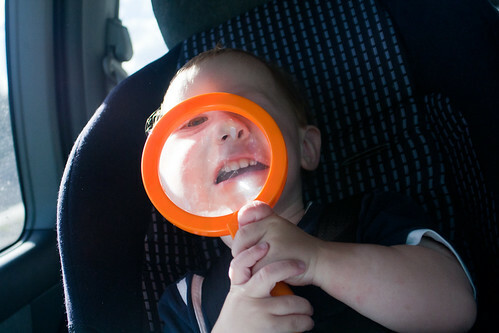 Kai would look at him and then Koen would say, `Hi!'. Kai was telling Koen about how many days are left until his birthday, how we were going to roast marshmallows etc. It got really cold at night and Koen doesn't use blankets. Fortunately Nana Jo made him a fleece sleep sack that he slept in and the heater kept us nice and warm. It was perfect! 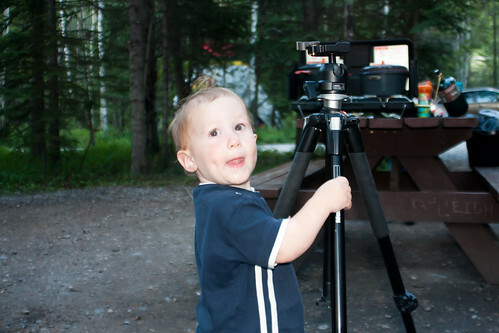 Every time Koen saw someone with a camera, he would face them and say `cheese!'. It happened a lot. 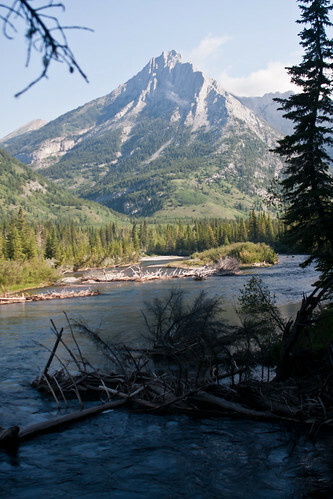 If you haven't been to Kananaskis, I would recommend it. Super awesome. Except for the mosquitoes. Yuck. The boys were up super early each day, about 6am. Quiet hours are until 8am so we took them hiking each morning as soon as they were up. We went to Kananskis Village which is super cute and only a 5 minute drive away. Fun to walk around. Playground. Ice cream. Beautiful views. Things to climb. The second night we moved 2 sites down to a trapper tent. I wanted to try each one:) It was roomier and warmer. I'm so glad we didn't stay in our regular tent, it would've been way too cold for the boys. 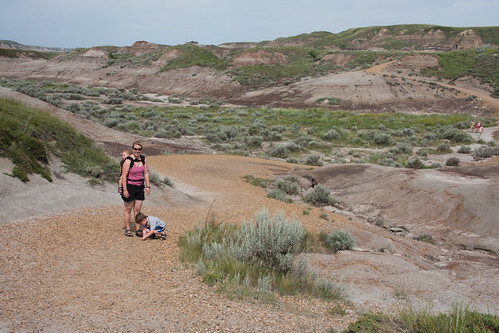 After two nights, it was off to Drumheller. 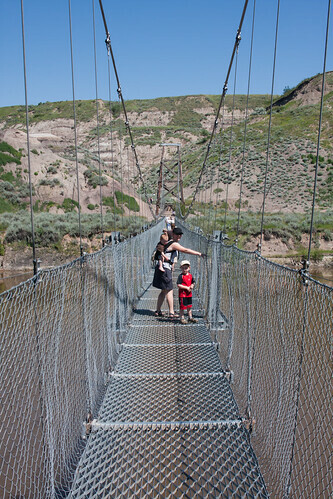 Drumheller was about 3 hours from Kananaskis (it's 1.5 hours from Calgary). 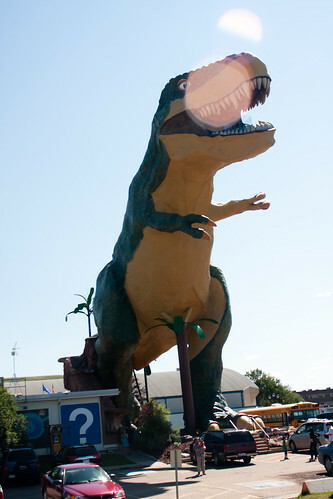 We went right to the info place where they have a great water park and of course, `THE WORLD'S LARGEST DINOSAUR!'. 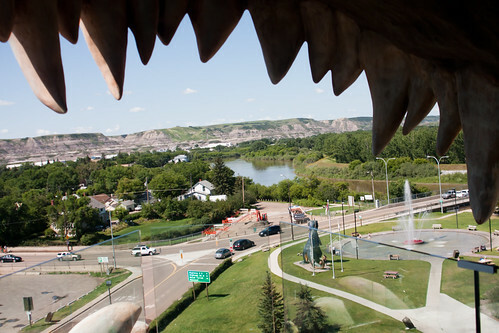 You can climb up inside it and this is the view out of it's mouth..
Drumheller is interesting. EVERYTHING is based on dinosaurs. They are everywhere. Everywhere. I can't imagine living there! 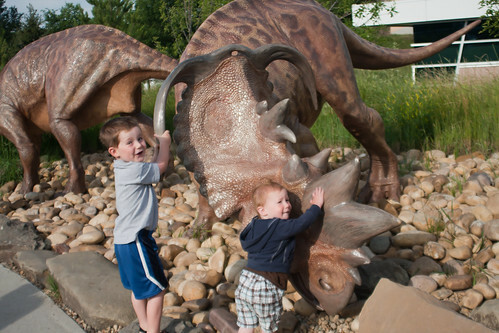 Koen was saying `Dido' (Dino) all day long and it got extremely annoying. 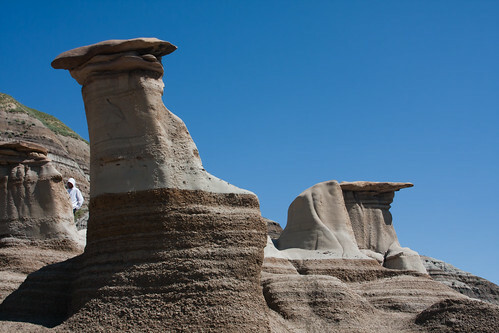 We went to for a 15 minute drive to the hoodoo's which are these sand/rock formations. 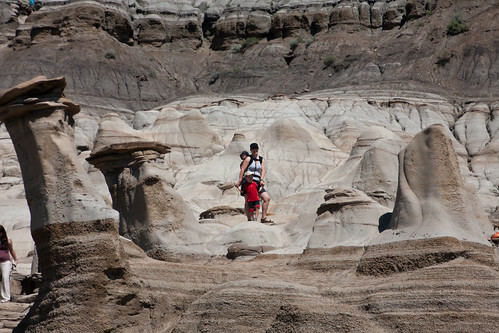 They are super eroded due to wind, rain and people so I imagine there won't be much left in a few more years. Koen was in the Ergo a lot and fortunately he was okay with that. It was just way easier than chasing him everywhere. Kai was great and it's so easy to just let him roam. He's pretty wise and safe at this age. 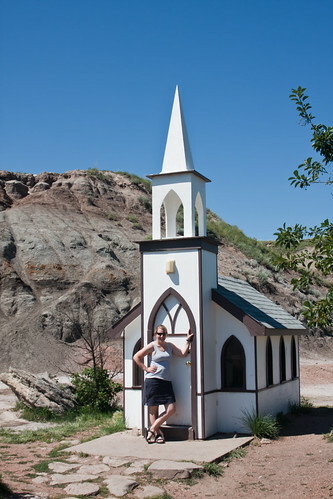 We visited this super small church on the way to the museum. The Tyrell Museum was super cool. I don't like dinosaurs, or museums, but I was impressed. 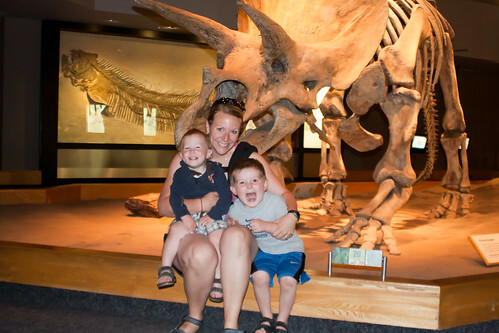 Totally affordable ($30/family or $10/adult with kids under 7 being free) and amazing specimens. I thought it was great. The boys went crazy inside and I have to say that Kai was at a great age for it. He loved it. Koen just loved running around saying `Dido! Dido!' over and over. And running into things and climbing on things. 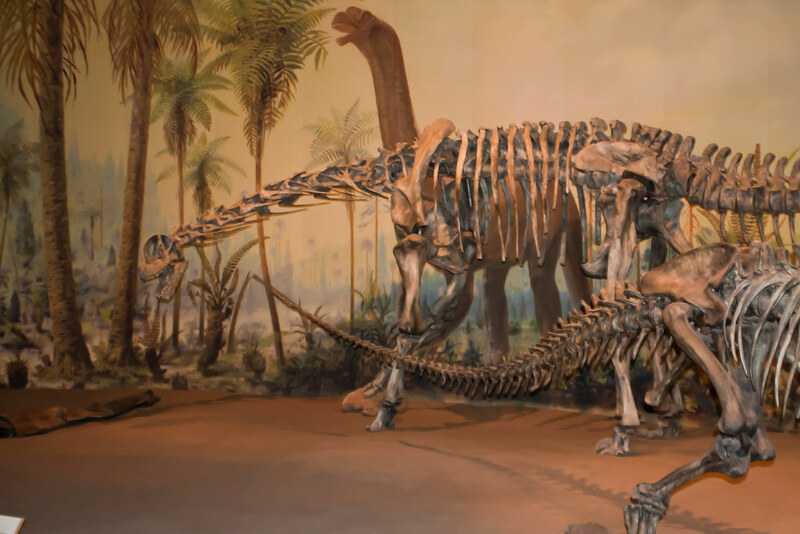 We talked to a guy who was extracting a fossil. 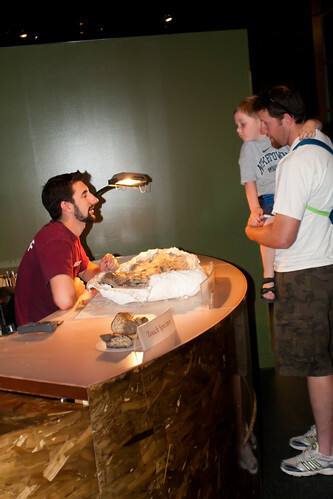 In case you are curious, to extract fossils, you need an Earth Science degree and then the rest of your training is done there. 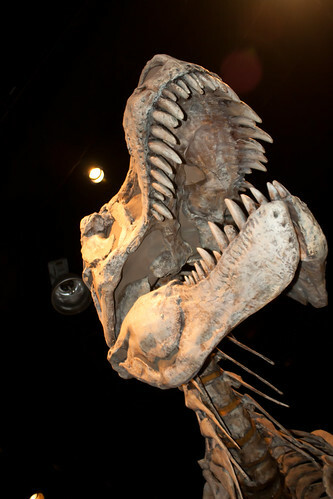 I was surprised by the amount of dinosaurs that they have displayed. 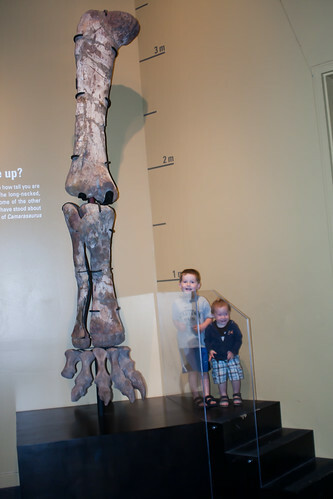 75% are real bones, the rest are casts because of missing bones or bones to heavy to display. 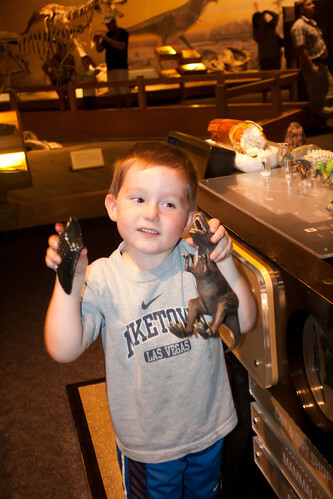 Kai showing a T-rex with it's actual tooth. We went to a lot of parks and playgrounds. Again, dino's everywhere! We stayed at `River Grove' Campground where they had cabins. It had a fridge, sink, bathroom and two beds. We could walk to the water park in 15 minutes. It was great. I'm so glad that we stayed in cabins rather than a tent. A little more expensive but still the camping experience. We went home in one day. We drove for 14 hours. Yikes. Kids were great. I was exhausted. Gary did a great job driving. Kai was pumped that we had dinner at his favourite `restaurant' (Subway). 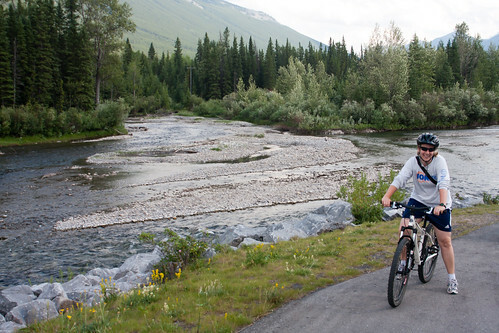 Here we are stopped at Finn Creek. Beautiful place for lunch. looks like an awesome vacation! Love it T rex!! glad the boys were good and that you got home safely after that crazy 14 hr drive! yuck! thats like 3.5 green lakes. Building memories - strengthening familial bonds... love it! I'm glad the Chapmans had a good vacation. so cool you got to sleep in a teepee! looks like a great trip! 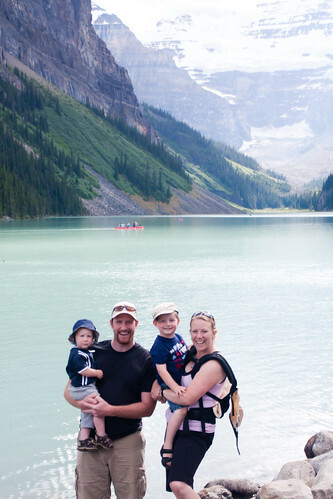 I love Lake Louise too! Beautiful pictures! 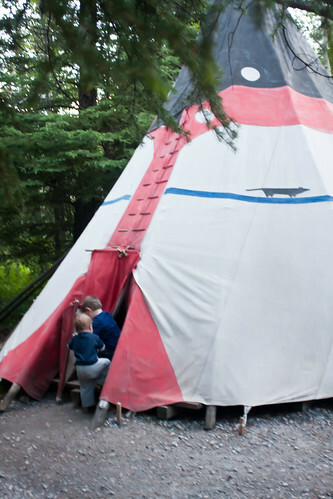 How cool is it that you stayed in a teepee? Looks like such a fun trip! Looks like you all had a great time! 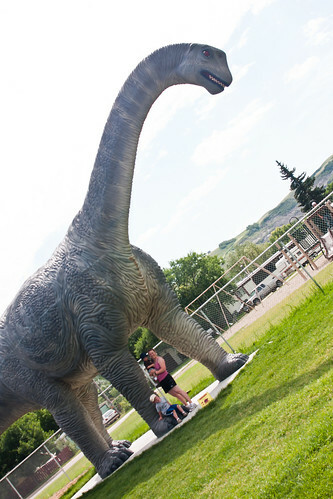 I love Drumheller but haven't been there since I was a kid. 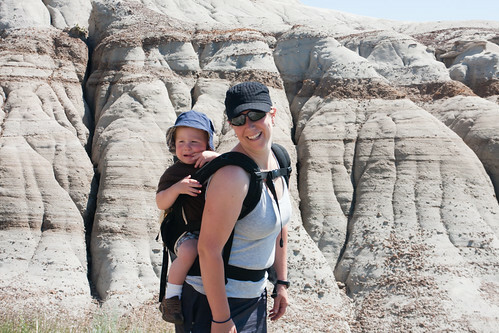 I also like the hoodoos! what a great adventure you guys have had! I love the look of that trapper tent...my kind of tent!!! 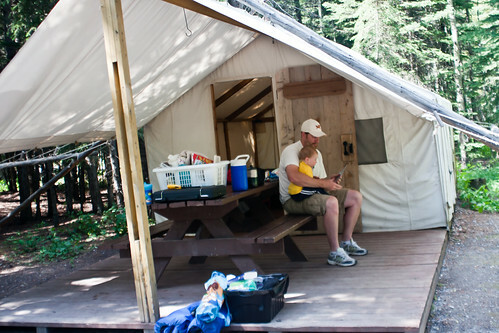 I also agree it is way easier camping with a toddler as opposed to a young babe! It looks like you had an amazing time!! The pictures are fabulous and the memories you have made will be priceless. I also agree......18 months is hard!!! They are so much fun but so tireless. Ah, yes, drumheller. All us Albertans are half pround and half embarrased of that place. Wow, what a great, action-packed vacay!! So glad you had a great time. Hope you get caught up on sleep soon. wow - what a beautiful adventure!! fantastic pictures and it's all so beautiful. that teepee and trapper tent both look really neat!